30 Henry Street. Image courtesy of BKSK Architects. Proposal to replace low-rise building on Henry Street criticized by neighbors who wanted bolder, contemporary design. 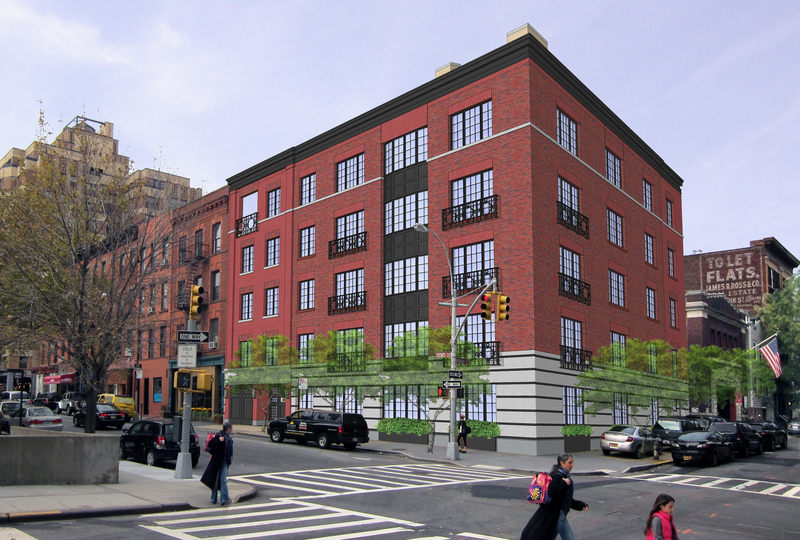 On January 17, 2012, Landmarks approved Fortis Property Group LLC’s revised proposal to replace a low-rise industrial building with a five-story apartment building at 30 Henry Street at the edge of the Brooklyn Heights Historic District. Until recently, the Brooklyn Daily Eagle newspaper occupied the 1963 brick building at the southwest corner of Henry and Middagh Streets. At a Landmarks hearing in December 2011, Stephen Byrns, principal of BKSK Architects and a former Landmarks commissioner, explained that Fortis wanted to design a building in context with Brooklyn Heights, using masonry and punched window openings. The plan called for a five-story building clad in red and flashed-red brick with an asymmetrical window scheme and a cast-stone base. The building will create five floor-through apartments and a below-grade garage accessed by a grandfathered curb cut on Henry Street. Several windows will feature wrought-iron frames and Fortis’ initial proposal called for the cornice and spandrels along the Henry Street facade to be made from glass fiber reinforced concrete. The building’s pedestrian entrance would lead to a courtyard with a small fountain. A large opening on the fifth floor along the party wall of the Henry Street facade would lead into an open air private terrace. According to Byrns, rooftop mechanical elements including elevator and stair bulkheads would be visible along Henry Street, but not from within the historic district. Landmarks lacked a quorum to vote on the project, and the December hearing was continued on January 10, 2012. At both hearings, Chair Robert B. Tierney read an email from Brooklyn Community Board 2 noting that it approved the proposal, although some board members wanted a bolder or more contemporary design. Representatives of the Brooklyn Heights Association testified in opposition. The Association’s Otis Pearsall said the design was “utterly antithetical” to the district, and argued that a contemporary design was the only appropriate approach for new construction. Supporters of the proposal included a representative of the Institute of Classical Architecture and Art, who commended the plan as “an ideal balance between continuity and modern accommodation.” Responding to the calls for a more contemporary style, Society for the Architecture of the City’s Christabel Gough pointed out that the landmarks law did not authorize Landmarks to promote a specific architectural style for new developments, and that such a mandate would be unfair to property owners. Commissioner Libby Ryan reiterated that it was not Landmarks’ role to dictate style, and found the proposal generally appropriate. Ryan acknowledged those who said the building was boring, but stated that “entertaining the public is not part of our charge.” She did recommend that Fortis reduce the rooftop equipment and modify the entranceway. Commissioner Michael Goldblum found the proposal timid, but within a framework of appropriateness. Goldblum, however, said the cut-out for the fifth-floor terrace was anomalous and felt out of place. Commissioner Margery Perlmutter found the approach acceptable, but expressed reservations about the cast-stone base and the use of fiberglass for the cornice. Stephen Byrns returned on January 17 with a slightly revised design. Byrns explained that inset horizontal steel banding had been added to the cast-stone base, which would create a more modern effect. Byrns replaced the cast-stone with brick piers along the pedestrian entrance and garage door, and the cornice and spandrels would now be constructed of painted metal instead of fiberglass. Chair Tierney said the revised proposal would appropriate for the district. Commissioner Michael Devonshire agreed, although he would have liked to see the caststone base replaced with a limestone base. Commissioner Fred Bland objected to the proposal, finding that the design was a “confused mixed metaphor,” saying he had hoped for a more robust overhaul of the design. Landmarks approved the proposal by a 9-1-0 vote. LPC: 30 Henry St., Brooklyn (12-6366) (Jan. 17, 2012) (Architect: BKSK Architects).